The SINAMICS S120 drive system is the system kit for industrial, high-performance applications in the fields of mechanical and system engineering. Numerous harmonized sizes, components and functions are available to design optimal solutions. SINAMICS S120 provides powerful single drives and coordinated drives (multiple-axis applications) supporting vector or servo functions. It covers the 1.6 to 1200 kW performance range with 380-480 V and 500-690 V (50/60 Hz) supply voltages. The SINAMICS S120 drive system is obtainable in the following formats - Booksize (1.6 to 107 kW), Chassis (75 to 1200 kW) and Cabinet Modules (1.6 to 1200 kW). Higher power ratings up to 4500 kW are implemented using a parallel circuit configuration. SINAMICS S120, Booksize format are available with 3 different cooling types. With the "internal air cooling" version, the power loss is dissipated to the inside of the cabinet through self-cooling and forced cooling. The "external air cooling" version is a version where the SINAMICS S120 heatsink extends outside the cabinet. This allows the power loss to be dissipated to an external cooling circuit. The "Cold-Plate cooling" is the third version. These particular units can be mounted on external heatsinks that, for instance, can be liquid cooled. Up until now, the SINAMICS S120 Chassis format was only available in the version "internal air cooling". This series of units has now been expanded by a liquid-cooled version. Contrary to the Cold-Plate cooling, in this case, direct liquid cooling is used. This means that the power components are mounted on a heatsink through which cooling liquid flows. 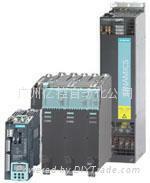 Cabinet modules are a modular cabinet system for multi-motor drives. The cabinet modules provide a compact and ready-to-use drive solution for use particularly in machines and plants in the paper machinery sector, rolling mills, test bays and hoisting gear. Thanks to standardized interfaces, the individual cabinet modules can be quickly combined with each other and installed.